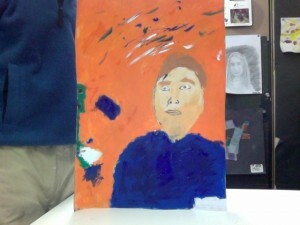 Recently in Art class, we have been making portraits with either complimentrary colours or realistic colours. I chose Realistic colours because I did not want to look like someone from “Avatar” (the movie by james cameron) or someone with green skin. I also think that with reallistic colours you can express more emotion. During this unit, I made many improvements with painting. However, I find pencil drawings easier to draw and put expression in. This is evident by the fact that my pencil drawing looks more realistic. To be honest, I found making the skin colour similar very hard. I ended up with a beard. I think i looked silly. 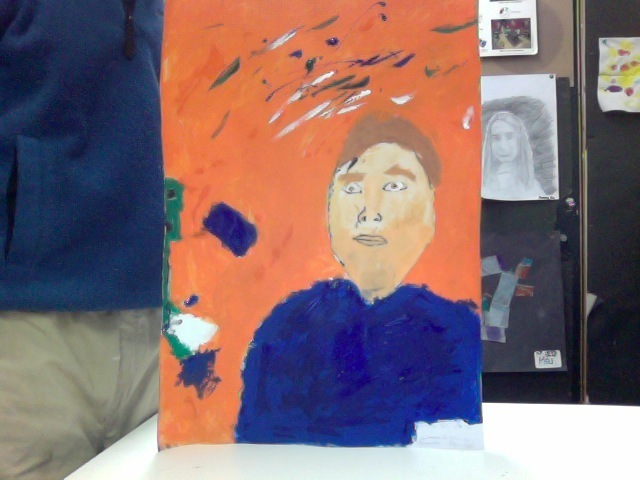 to make this less noticeable, I put more skin colour on all of the face. I believe that I improved at making my face look realistic compared to older paintings, which made me look like a zombie from mars, from my opinion. I think this is an acomplishment because I do not like zombies. Zombies are scary in minecraft. However, I think I could have put more tone into the painting, because at maximum, i have 3 in a part of the body. I showed my identity by putting in the painting the most feared creature in minecraft, which I like. The creeper. it is displayed prominently at the side of the painting. I also put in a piece of paper and some tape because I Like to make models out of these materials. I also chose realistic colours because I prefer realistic colours, and the orange background was because I felt like putting orange on the background because i thought it would look nice. I put the strange paint on the top because I am a little strange. Here is a photograph of the portrait. The person beside it is me. Recently, in English class, we have been making a podcast. All of us had to make an podcast with garageband, and we exported it as an mp3, which we then sent to our teacher via dropbox. dropbox is a file sharing website and application, from what i can tell. Having a real audience affected me because I got worried and nervous during recording. I also tried to avoid revealing my entire name because I was paranoid. Speaking with others helped me to get over my paranoia and nervousness of the podcast. I also managed to learn how to work on the tech and other things. I think i could make my next podcast better by speaking louder and remembering to save my garageband before turning it off. that is how i deleted my podcast. This is one of the many podcasts made by 6c. The three great civilizations, Egypt, Greece, and China, have had a class system. All civilizations had a class system. Usually slaves and labourers occupied the very bottom of the class system while the ruler occupied the very top of the class system. in Greece, the ruler, or rulers were elected so at least 5 rulers were at the top. In Egypt, there was usually a sole ruler called a pharaoh, who was believed to be a god. In ancient china, the ruler was an emperor, and ruled an Chinese empire. Most civilizations had a sole ruler, but a few had more than 1. Greece, for example was ruled by a “senate” for a long period. a few rulers came to power violently, with revolutions and wars. Almost every ruler who ruled because of this was often a warlord. All of these civilisations had advisers to the ruler, such as the Egyptian vizer. then there were usually priests or some other religious figure. while at the bottom were slaves, labourers, and farmers. a labourer was like an general dogsbody who did manual labour, and they were like paid slaves. There were then skilled craftsmen who were slightly higher on the triangle. Then there were the merchants and scribes. solders were regarded very highly in ancient civilisations. However, in the modern day, soldiers aren’t as important or popular. modern civilisations are more pacifist than their ancient counterparts. Then there were government officials who controlled taxes and and noblemen who were just rich, and priests who controlled religion. then there was the rulers. in china and Egypt, there was a sole ruler. in Egypt it was a Pharaoh and in china it was an Emperor. However, in Greece originally there was a sole ruler, but after a small revolution, there was an senate instead of a sole “tyrant”. In ancient Greece, an ruler who came to power by force was called a tyrant. most of Greece’s early rulers in Athens were tyrants. most Greek city-states had a sole king of the city-state. for example, the Greek island of Crete had a king, as seen in the greek legends as king Minos. It is proven that Crete actually exactly existed, as seen in the oxfords book of children’s history. Almost all ancient civilisations had an single ruler in one form or another. In modern times, most places do not have a king who controlls everything. now most countries have an ceremonial king who is just on display. For example, the British queen does not do much, other than wave at people, and cut ribbons with golden scissors. many countries do not have a sole ruler, but instead they have a group of people who elect a ruler, for example, the prime minister. Most countries have an government like this, where most people, regardless of class, can vote for a leader. 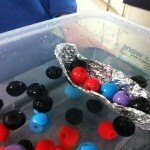 The science behind the boat was the force of gravity pulling it down. For things which float, there needs to be an upthrust which is equal to the force puling it down. Then, there is also the matter of displacement of the water. if a boat is heavy, it displaces more water. and if a boat is less heavy it displaces less. 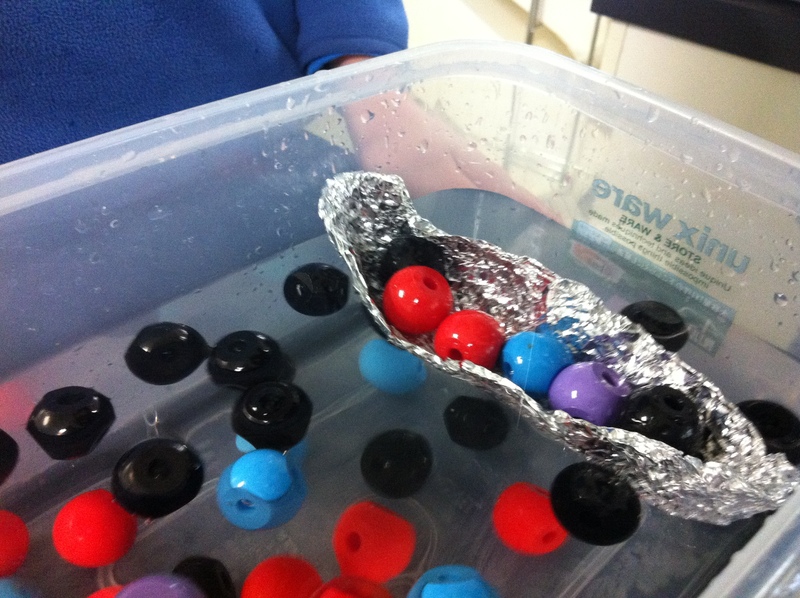 if you put “atoms” in the boat it gets heavier and it displaces more water and if it displaces too much water, it comes over the sides and the boat sinks. if you want a more detailed explanation go to brainpop and look for a video on floatation. They explain it better than me. My boat was good because it was shaped like an canoe, however, I think I could have improved it by making the sides higher. 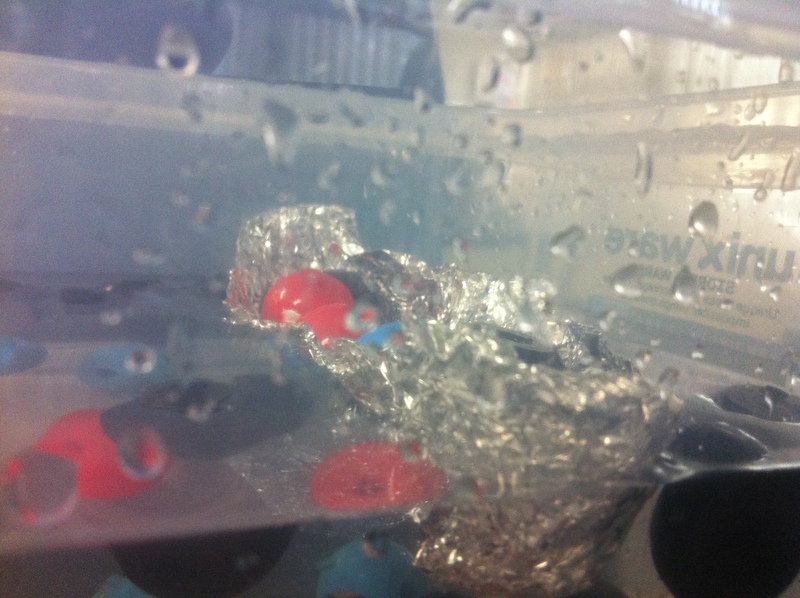 Photos were taken by Sena during science class with alex’s iphone. Sena’s boat held the most “atoms”. the “atoms” were plastic balls to make model molecules as atoms. so the red would be oxygen, and so on. My boat held 16 atoms. sena’s held 36 and I forgot how many alex’s held. 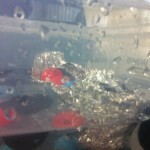 overall, i think that sena is best at building foil boats.